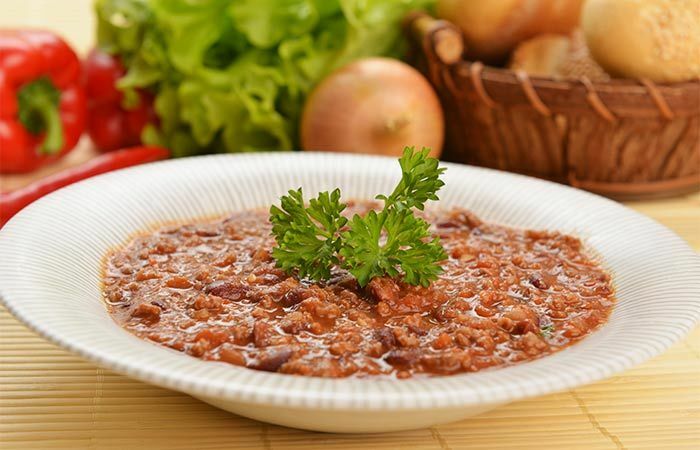 Here comes the best vegetable soup for weight loss made with rajma or red kidney beans, this soup easily doubles up as a simple main course. The low fat milk used here enriches the flavor of the soup, making it creamier and richer. Thoroughly wash the kidney beans and pressure cook with washed, grated carrot. Add 1 tsp oil to a preheated skillet and sauté onions, ginger, and garlic until golden brown. Add tomatoes and cook until tomatoes turn pulpy. Keep aside the water from the cooked beans and keep aside half of the beans. Mash rest of the beans well. Add mashed beans and enough salt and bring the mixture to a boil. Take off from the heat and allow it to cool down. Transfer to a blender along with red chili flakes and blend to a smooth puree. Add to the skillet again, mix in the non-mashed beans, and simmer for 2 minutes. Sprinkle chat masala, garnish with coriander leaves, and serve hot.